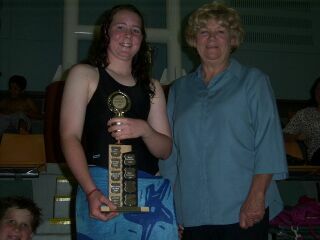 13-YEAR old Erin McLachlan swam strongly to win the 2002 Barbour Cup for 100m Butterfly yesterday evening. In a full field of 11 finalists Erin swan within 0.18 seconds of her time to win from Brett Munyard and Peter Castieau. Donor of the trophy Joan Barbour was on hand to witness the event. "They swam beautifully", she said. President Lydia Ciffolilli also praised the event. "It's good to have a Life Member here to witness the swimmers' efforts and present the trophy," she said. Joan Barbour established the Cup to encourage swimmers in the 100m Butterfly. "There was no Cup for Butterfly, and few swimmers would do the event. The Cup is to provide them with insparation," she said.